Prior to 2005, Longa was a solid WC skier, but her best result was a 7th along with a handful of other top-20’s, mostly in classic races. She took a break during the 2005-2006 season coinciding with her pregnancy (and missing the Olympics in her home country! 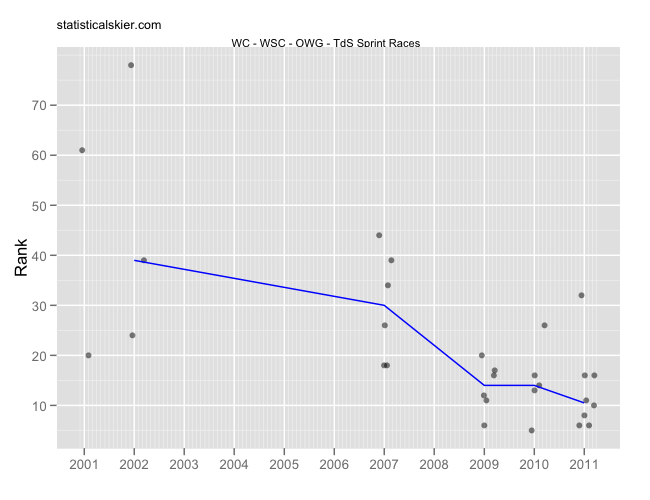 ), and then returned in the 2006-2007 considerably faster, leading to four top tens, including one at World Championships. Then she “retired” in the spring of 2007, only to return again late in the 2007-2008 season, once again even faster than before. Indeed, the subsequent season, 2008-2009 was hands down her best. Five of her nine podium finishes (all distance, including TdS) came in this season, and most of the rest came during this past season’s Tour de Ski. The gaps in the lines here may seem confusing, but I’m just omitting any calculation of a median when Longa did fewer than 3 races of a given technique. 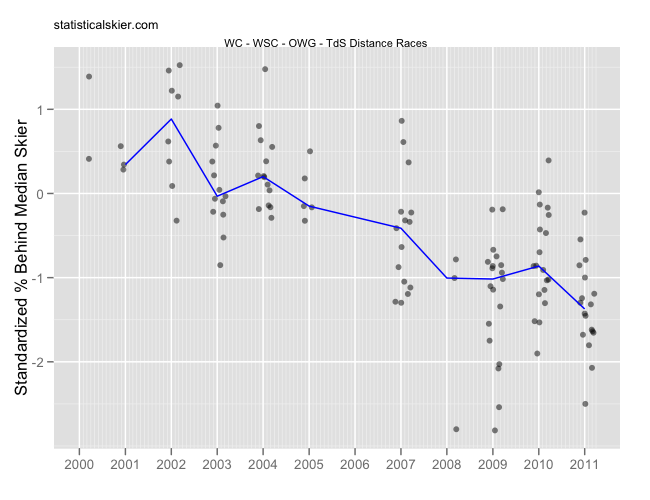 Generally, she seemed to be stronger in classic races, and typically did more of them as well. 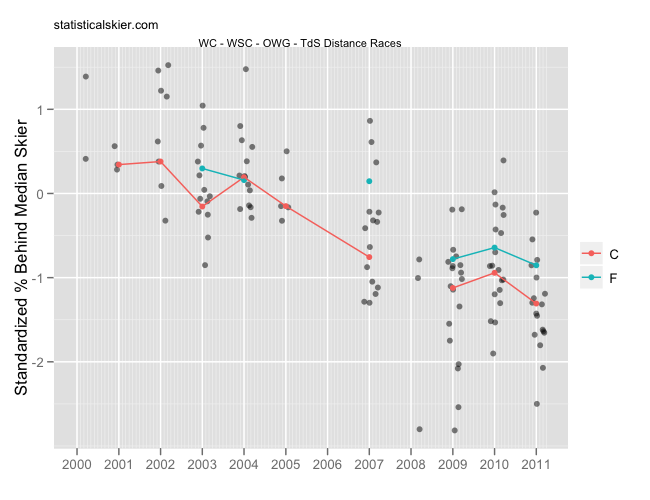 But her only WC victory came in a 10k freestyle mass start in 2009. Many of her top results also came in pursuits, which is a bit unusual for someone who tends to be better in classic. Often, it’s the other way around. She didn’t do much sprinting until the Tour de Ski rolled around, an event she certainly had some success in, including a 3rd overall this past year. I guess the big question is whether Longa is really serious this time. She’s not terribly old (~33) so perhaps she’ll change her mind. I, for one, certainly hope so. Posted by Joran on Friday, May 27, 2011, at 6:00 am. Filed under Career Retrospective, Cross Country. Tagged career retrospective, italy, marianna longa, skier retirement, women. Follow any responses to this post with its comments RSS feed. You can post a comment or trackback from your blog.